In last week’s post “4 Simple Checks for Better Bagpipe Blowing,” I mentioned finding a chanter reed that is within your strength limits as a simple check toward better blowing. That got me thinking that further elaboration is probably in order. Over the many years I have spent teaching and playing with pipers of all levels, one thing has always been consistent: Too many pipers choose chanter reeds that are too hard to play for them personally. Anyone who thinks it is a “badge of honor” to play a gut-busting reed is just plain crazy. It also does not make you a better player. A balanced well set bagpipe is a balanced well set bagpipe, regardless of reed strength and, as discussed elsewhere, the strength of the chanter reed will have a big affect on your ability to achieve that balance. Some pipe bands get a nice full sound by putting their pipers through the torture of breaking in stiff reeds. Yes, it is likely that a nice, stiff reed will last a long time and have great resonance. However, if it is beyond your strength tolerances, you will never get that full resonance because you will be unable to make it vibrate fully. You will have to scrape it and pinch it to make it easier thereby shortening its life and reducing its resonance—so what’s the point of having it? Once upon a time, good reeds were like two planks of timber wrapped together. They took forever to break in and gave many a piper a hernia or a headache. Things have changed thankfully. These days, you can have a reed that has a good response regardless of strength. Modern chanter reeds are built to get instant response with a minimal break-in period. A reed with good response will take the least amount of air to vibrate fully and get a full, crisp sound. 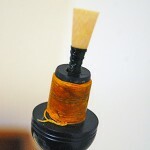 Be aware of how hard you are blowing when testing the reed in the chanter out of the bag. A reed that is suited to your strength should not be harder to blow once you put the chanter back into the bag. If it is, then you must examine the air efficiency of your instrument. 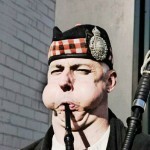 If you can play the reed out of the bag, but your face is turning beet red (and you are about to lose control of bodily functions), then guess what, it will not get any easier with the chanter in the bag. Again, the amount of difference (chanter out vs. chanter in) is different for everyone, so it is important that you are aware of your own blowing tolerances. You should be exerting some amount of effort (the reed should not be wimpy), however, comfort is key. Reject chanter reeds until you get the one you feel you can blow comfortably with a sustainable amount of effort. 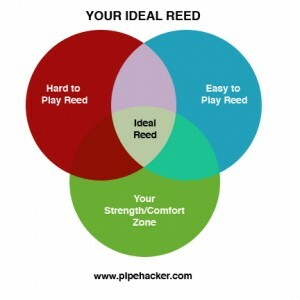 Find a reed that you believe is “perfect” for you and that feel you are blowing comfortably (call this reed 1; the left circle of the diagram). Reject reed 1 and find a noticeably easier one (call this reed 2; the right circle of the diagram). 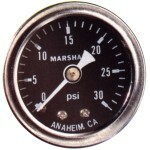 This will give you a good indication of where your tolerances lay. If this new reed requires little effort to play (which can be just as uncomfortable), then you have found the working area of tolerance. Find the reed that sits within the strength of reed 1 and 2 and you have found your ideal reed. You may find that reed 2 seems perfect but might be harder to play than reed 1. In this case, reed 2 becomes reed 1 and you then find an even easier reed that then becomes reed 2. It is really a matter of disregarding your own judgment to readjust it. In general, any reed that you consider perfect, consider it too hard and find an easier one. You may want to experiment with this technique, picking reeds that shrink the tolerance area between reeds 1 and 2, until you do, in fact, find the “sweetspot” (as illustrated in the center of the diagram) where the strength of a chanter reed is clearly perfect for you.